SLEEP - THE LAST FRONTIER? If you live to be 100 years old that is 292,000 hours, 12,166 days or 33 years. At that rate you could sleep your way to a distant star system in a time capsule on a space ship. Or, more simply, lay down at the end of each day on our blessed Mother Earth and experience a deep natural sleep and wake up rejuvinated. Ideal for guests at country inns and upscale hotels and motels the Flobed mattress is made of the "right stuff" for wild lovers who want deep natural sleeps. 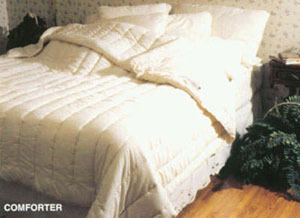 Combine the Flobed sleep with starwatching and you can have the kind of sleep that inspired EINSTEIN to create E=MC2. Thats right. A trick leading problem solvers use is to starwatch for a minimum of 20 minutes before you go to sleep. Write the question you want the answer to in the stars over your head, concentrate on it and go to sleep on a Flobed. During the night the Flobed natural materials will actually help you problem solve during rem sleep. Wake up the next morning and the first thing you do is write down the answer with the paper and pen you put next to your bed the night before. Leading nuclear and rocket scientists problem solvers that worked at Lawrence Livermore Lab and Los Alamos told me this is what they did when they were stuck. Too cold to sit outside and starwatch - do it from your Flodbed and gaze through the bedroom skylight. So, whether you have to rethink the design on the kitchen or bathroom or create the next miracle in your life - do it on a Flobed! Dave Turner and his "perfect sleep engineers" use combinations of stackable natural latex layers, memory foam and air ‹ wrapped with organic cotton bedding material ‹ so your mattress becomes your own personal sleep signature. 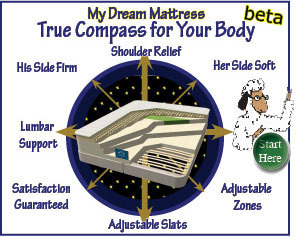 They even custom design special zones in your mattress to accommodate for sensitive or sore areas, such as your neck, shoulders or back. Once youve picked a bed, they can ship it to you, and it arrives within a week. But thats not the end. They will work with you to fine tune your new mattress. Sharing your bed? No problem. FloBeds unique construction incorporates stackable natural latex layers on each side of the bed, ranging from soft to firm, that are layered to achieve individualized comfort and support. This means that, if you're sharing your bed, layers can be rearranged to change the firmness for each sleeper. Exquisite Cover of Luxurious 100% Organic Cotton EuroKnit quilted to 100% Pure Eco-Wool -- unzips completely for easy fluffing and freshening. You can sun in the Spring and Fall to sanitizeand freshen (sun will kill dust mites). Breathable - Cotton and Wool keeps you warmer in the winter and cooler in the summer. Wool is natures finest bedding fiber. In the winter it maintains body heat while allowing air to circulate; resulting in a warm dry sleeping environment. In the summer, wool again allows air to circulate, and the natural wicking qualities of wool enable it to wick away one third its weight in moisture, helping you sleep cool and dry. 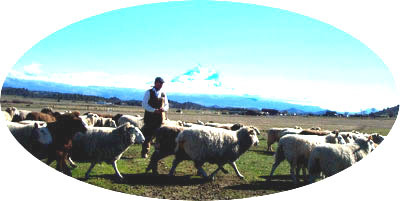 Flobeds wool comes from grazing sheep who are raised near the mystical slopes of Mount Shasta, California (see above photograph). Chances are most of the next generation will be conceived on a bed. Why not give your child the gift of natural conception on a Flobed? Reduce stress, increase the love quotient - GO WITH THE FLO!